To understand Madison’s relationship with cannabis, we need to take a step back. The hemp plant was utilized for centuries in America for its industrial, medicinal and recreational uses. It was even one of George Washington’s top three crops at his home in Virginia. But as the 1800s ended and marijuana was being associated more and more with new “violent” Mexican immigrants, Americans shifted to exiling their once beloved plant. Hemp could be used as a cheap substitute for paper pulp for newspapers and was competition for the timber industry, both areas that newspaper tycoon William Randolph Hearst had significant investment in. In the 1930s, Hearst used his media power and yellow journalism to demonize cannabis and connect it to crime. The last push for federal law came from Harry J. Anslinger, head of the Federal Bureau of Narcotics created in 1930. After a few years of connecting cannabis to violence and over sexuality through propaganda— i.e. 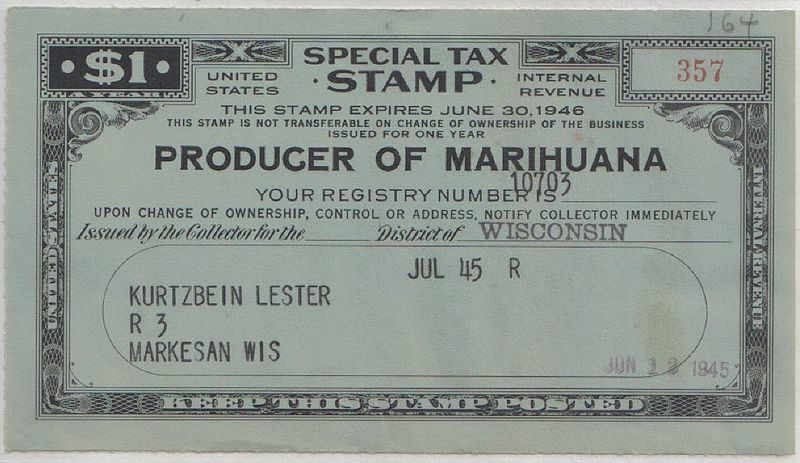 Reefer Madness, 1936—the Marijuana Tax Act of 1937 was passed. Over the next couple decades there we’re efforts to show the industrial value of hemp. During World War II, the Hemp For Victory program was launched by the U.S. Department of Agriculture to encourage farmers to grow hemp for materials needed in the war: ropes, parachutes, and other military necessities. After a harshening of laws in the 1950s, the last commercial hemp fields planted were in Wisconsin in 1957. The 1960s was the time for counterculture. With the Vietnam War raging and the University of Wisconsin a hub for riots and protests, Madison became radical. To oppose the war, a peace movement began, interwoven with marijuana. Smoking became normalized and more publicly accepted. Yet as the pendulum swung closer towards legalization in this era, it swung back as the 70s died down and the War on Drugs in the 80s was pushed into full force. Activists have been pushing back ever since. In current Madison, the drinking culture seems to be ever present. With the University of Wisconsin in the middle of town, there is a contant influx of new students trying to live up to the party standards. Although, this has not always been the case. The Mifflin Street Block Party is a yearly gathering for UW-Madison students to enjoy outdoor shenanigans and have an excuse to drink. But it originally started though in 1969 as a protest to the Vietnam War. Places like Amsterdam were said to have been inspired by Madison’s culture as they were crafting their own. Madison is well know for its history of “peace lovin’ and cannabis usin’” but is having a current struggle with its alcohol abuse that arguably outshines its cannabis culture. Wisconsin consistently has the highest rates of binge drinking among adults according to the Center for Disease Control. The University of Wisconsin, like many universities, has a relationship with drinking and has been ranked in top lists for “Party Schools.” As alcohol has devastating affects across the state though, marijuana has never been accountable for a single death in it’s history. Madison is once again swinging heavily towards legalization. The 2010 state ballot contained an advisory referendum asking voters if they supported the legalization of medical marijuana. Seventy-five percent voted in favor. In the 2012 presidential election, Colorado and Washington voted to legalize recreational marijuana and Massachusetts to legalize medical marijuana. These are large steps for the movement that took a lot of the country off guard. Now that some states have accomplished it, that may have been all it took to get the rest of the states to rethink their own cannabis laws. What will Madison write in the history books next? Only time will tell.